Hi, I purchased your book Family Feasts for $75 a Week a while back and my family loves your recipes. Right now I’m in a bit of a jam… I just moved literally 4 days ago and now I can’t find the cookbook. I was going to make your meatloaf for dinner….I’m desperate here. Can you send me the recipe for the hearty meatloaf??? After I sent her the recipe, I thought maybe other folks would like to try it too. So here you are! Meatloaf uses up a lot of meat in one meal, so I only serve it once a month or so. But it is delicious and very quick to put together. I typically double this recipe and bake it in a 10-inch Bundt pan, as shown above. 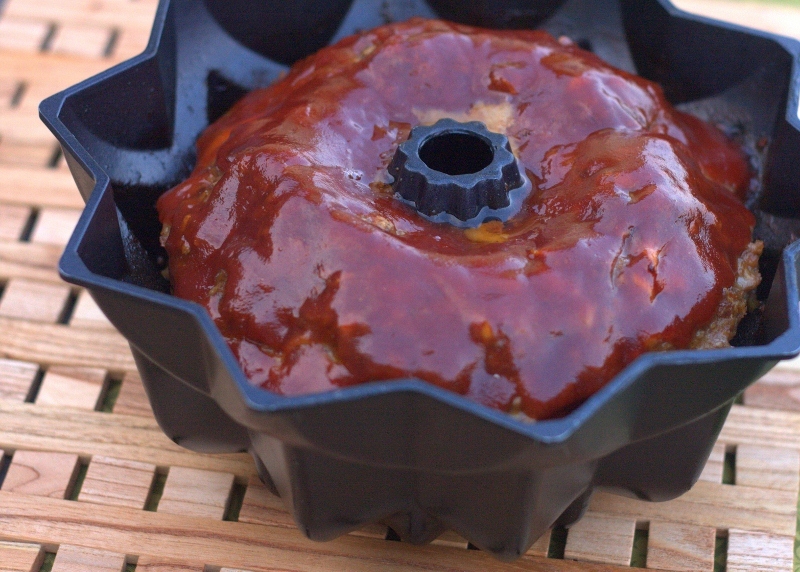 This allows the meatloaf to cook more quickly and evenly. I like to serve meatloaf with baked potatoes, since they take the same amount of oven time. If you get a lot of ground beef on a good sale, consider making a meatloaf or two for the freezer. 2. Combine the meatloaf ingredients in a large bowl. Mix well, using a large spoon or your hands. Press into an 8-inch square casserole dish or a 10-inch Bundt pan. 3. Combine the glaze ingredients in a medium-size bowl until well mixed and drizzle evenly over the top of the meatloaf. Bake for 1 hour. Donâ€™t forget to toss in some potatoes to bake while youâ€™ve got the oven turned on. When I made this last year it replaced our previous go to meatloaf recipe – its easy and delicious. Yay, I’m so glad you enjoy it! I have made and frozen your meatloaves so many times. I also make the sauce ahead of time and freeze it in separate ziploc bags along with the loaves. I stretch the meat substantially by adding shredded white squash , yellow summer squash, butternut or spaghetti squash, or whatever is relatively inexpensive and not too flavorful. I can double the recipe with just extra veggies adn my family does not even notice. Also, I use flaxmeal instead of eggs to help hold everything together. The ration is 1T of flaxmeal to 3T warm water, let it set for a few minutes. THis also works well in baking. I have meatloaf skeptics – but I’m going to try this recipe this weekend. Thanks, Mary. I am wondering tho – how many do you make at once? As in, how many per meal? I doubled this recipe last night and got 10 good-sized servings, which 8 people ate all gone quite happily. Everybody always wants seconds when I make meatloaf. The recipe for meatloaf sounds lovely, but I wanna know what else is on the plate in the photo. It’s definitely not a baked potato. If wanting to replace meat try using half tofu or half TVP (textured vegetable protein) with meat. These products work great in any dish that has meat. Use half and half–saves a ton of money and the vitamins are still there. And instead of baked potato in these summer months, try making hobos and meatloaf on the grill. Cut up potatoes with onions, and a dot of butter wrapped in tin foil. These can be made with mushrooms, green pepper, banana peppers, brocolli, corn, etc. and/or are just fantastic with just potatoes and onions. Great idea to cook it on the grill! I’ve been doing a lot of cooking in the garage in my turkey roaster too. Keeps the vast majority of the heat out of the house.